This review copy was kindly donated by Orbit Books. Helen and Troy are just two regular teenagers. Okay, well Helen is a Minotaur and Troy is as close to a hero as you can get (he doesn't like dogs). Anyway, Helen and Troy are just two regular teenagers who almost get eaten by a god and then are forced to go on an epic road quest to get an unknown number of unknown relics in an unknown period of time. As you can imagine, Helen and Troy aren't so excited about this quest. Luckily, the National Questing Bureau and Achilles, Helen and Troy's trusty sidekick dog, help them along the way. Because the other gods are not sure that the questing adventures aren't going to kill Helen and Troy, they also send a band of orcs after them. Helen and Troy probably wish that they called in sick to work right now and never started on this merry adventure. This book is so much fun. Once I started reading it, I could not stop. Helen and Troy are quirky but fairly calm about this whole situation. I guess when Minotaurs, orcs, and gods are real, you just have to go with the flow. The writing is fantastic, the characters are charming, and the plot is entertaining. This book is the perfect way to spend an afternoon. The book lost one star, because I feel like the book was a bit tidy with the climax at the end; however, I am willing to look past the ending, because the rest of the book was just a rollicking good time. 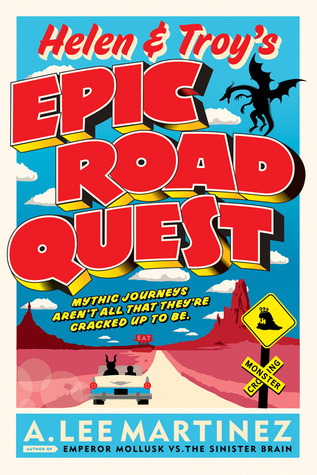 Sign into Goodreads to see if any of your friends have read Helen and Troy's Epic Road Quest. 10.0% "Let's go an adventure!" 75.0% "Helen and Troy are beating monsters and winning relics! Go team #epicroadquest"